With a population of 12 million, crime is an everyday occurrence in Guangzhou. The worrying bit is that not all crimes are carried out by amateur hooligans. In fact, a large number of crimes are attributed to professional gangs. The fact also is that one Canton Fair visitor was robbed and killed in Guangzhou in 2003. News reports show that with the banning of motorcycles in Guangzhou, criminals have found a new way to carry on their trade. Unsuspecting pedestrians are grabbed and dragged into minivans, where the thieves not only rob the person of everything she/he has but also force ATM passwords out of people and clean out their bank accounts. Those traveling by car or taxi have experienced robberies while the vehicle is idling at a red light. Robbers open car doors and grab bags, mobile phones and anything else they can get their hands on. Tip1: use licensed taxis rather than private cars or minivans in order to avoid potential robberies. Tip2: do not share the same car or minivan with strangers. Tip 3: Even when traveling safely in a taxi, one should keep an eye on his/her possessions at all times to avoid someone reaching in and grabbing them. Tip4: take care of personal belongings when one is at the train stations or certain goods wholesale markets such as garment markets, shoes markets and car parts markets. Tip5: Men should steer clear of women looking for one night stands in bars or street women; many robberies occur this way. Recent years, there are more criminal gangs target foreign visitors by attracting them with women at bars and robbing them at hotels or other places, since this kind of robbery can make 10 times more profit comparing to the street robberies. Tip6. Choose a hotel in a safe location. It is recommended keep away from those locations where street robberies happen in the morning. e.g. leasing houses (slums), and certain whole sale markets. Wentrip recently created a rating system for hotels in terms of safety. This safety rating is based on a survey of long-term residents of Guangzhou, those who have lived in the area for 20 to 30 years and know the city extremely well. According to Wentrip’s safety rate system, hotels are rated on a safety scale of 1 to 5, where a rating of 5 means that the area is so safe that one can walk around alone even at midnight. On the other hand, a hotel with a safety rating of 1 means that the area is crime ridden and robberies occur in broad daylight and in public places. China Import and Export Fair, also called Canton Fair, Foire de Canton, La Feria de CANTÓN, Übersicht Kanton-Messe, Fiera di Canton, Feira de Canton, is held twice a year in Spring and Autumn since it was inaugurated in the Spring of 1957. It is China’s largest trade fair of the highest level, of the most complete varieties and of the largest attendance and business turnover. Preserving its traditions, the Fair is a comprehensive and multi-functional event of international importance. 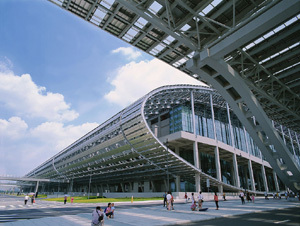 The Canton Fair 2010 will be held in Guangzhou from April 15th 2010, please contact our Canton Fair Division for more information, or read our Canton Fair Review. You are currently browsing the archives for the 107th canton fair category.